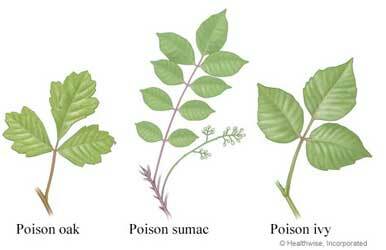 Allergic rashes related to poison ivy, oak, and sumac are caused by contact with oils contained in these plants. The severity of a reaction to these oils varies from person to person, and can become more severe in the same individual with repeated exposures. These rashes aren't contagious in the real sense. You can't give someone poison ivy if they touch your rash. However, unless you thoroughly wash the oils off your skin and items that the oils have touched, you can spread the oils around by rubbing or scratching, wearing contaminated socks or clothes, or otherwise touching contaminated items. Wash clothes and other items, and bathe pets that could have been contaminated by the oils. Use gloves to avoid re-exposing yourself. Don't rub or scratch your rash. Use lukewarm rather than hot water for baths or showers. To soothe your skin and help dry a weeping rash, use baking soda or an OTC product like Aveeno powder in your bath. You can apply calamine lotion if your skin isn't broken and your reaction is mild. For itching, use a non-prescription topical hydrocortisone cream and/or oral antihistamine, if necessary.